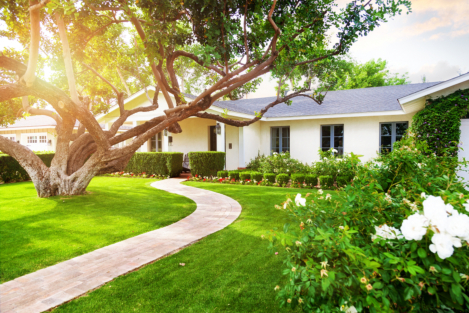 A well-landscaped area is very easy to appreciate—you may find yourself just standing there and taking in the sights, smells, and even sounds afforded by a lawn or landscape. However, did you know that landscapes offer a much more substantial benefit than just pleasing aroma and aesthetics? Plants—and grass, most especially—do a great job in capturing dust, smoke particles, and other pollutants. A healthy landscape then can help keep your home cleaner and with a safer-to-breathe air, since they also turn carbon dioxide into fresh and breathable oxygen for us to breathe. Since plants absorb carbon dioxide and break them down, converting them into oxygen, a landscape provides a significantly cleaner and much cooler atmosphere. Grass even is regarded as an “air conditioner” for its surrounding area as they can be 31 degrees cooler than asphalt. Summer days will no longer give searing heat when you have a healthy and maintained landscape! Plants and lawns can actually dramatically decrease noise pollution, as they absorb noise well, instead of bouncing sound waves and amplifying it much like concrete and pavement do. In fact, a landscaped lawn can reduce noise levels by 20 to 30 percent. Studies have shown that even just looking at plants and trees through a window can already reduce stress and lower blood pressure levels. Having a landscaped area in your home, then, can give you that private place where you can relax, take in the fresh air, see and listen to your environment, and de-stress. According to a particular study by Marc Berman of the University of Michigan, walking in a natural environment with trees and plants has been shown to enhance one’s attention and memory skills. Having a landscape in your home not only helps your body, but your mind too. It is no doubt that plants and trees provide many significant benefits to both the environment and to humans. Having a natural environment just outside your home—or even commercial space—then, can give you and your family (and even your pets) a better quality of living. Not to mention, a landscape can beautify your place, and showcase the unique personality of your home. AJ Tree Service offers services in tree removal and landscaping in Tulsa, Oklahoma. We are dedicated, honest experts in tree removal and landscaping as we help you achieve the landscape of your dreams. If an old and withered tree poses a potential safety hazard, you can also trust that our tree removal service can have it taken off from your property with ease and a mind for you and your family’s safety. This entry was posted in Landscaping and tagged Cognitive Enhancers, Natural Environment Cleaners, Stress Reducers. Bookmark the permalink.